From left: Audrey Heins, assistant director of graduate student affairs and QTHON adviser; Christopher Diaz, co-executive director; Brittany Coda, co-executive director; Julia Gonsalves, operations chair; Abbie O’Neill, hospital relations chair; Ian McCracken, catering chair; Jessica Blitz, technology chair; Amy Katan, co-morale chair; Sam Johnson, co-morale chair; Alix O’Brien, co-fundraising chair; Gabby Barbosa, co-fundraising chair; Tiffany Albanese, co-public relations chair; Justine Holleran, co-public relations chair; Amanda Coda, co-dancer relations chair; Jessica Walsh, co-dancer relations chair; Shamus Naughton, co-sponsorship chair; and David Quin, co-sponsorship chair, each hold up a card with a number signifying the total of $115,685.13 that was raised during QTHON at Quinnipiac University. 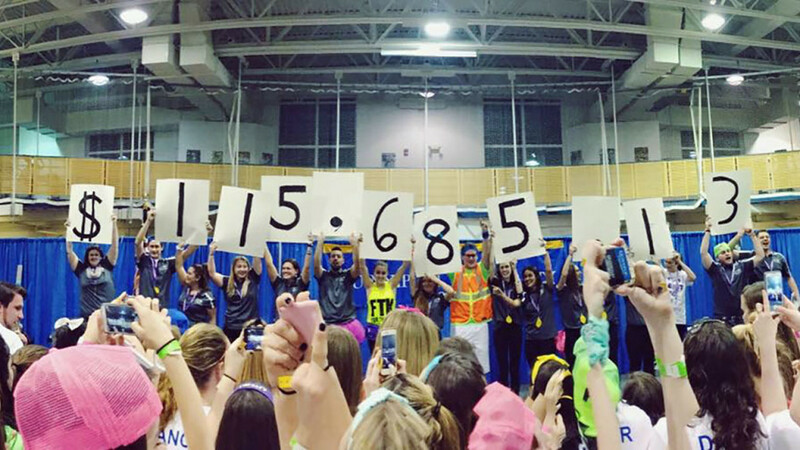 Quinnipiac University students recently raised more than $115,000 for the Connecticut Children’s Medical Center by dancing for The kids at QTHON, a seven-hour dance marathon that attracted 900 students, in the Athletics and Recreation Center on the Mount Carmel Campus. Leading up to QTHON, students sponsored various events and fundraisers throughout the academic year to raise money for the hospital. The management team also hosted the “Why You Dance” campaign, where students wrote reasons why they dance across their arms in an effort to promote the event. By surpassing their goal of $75,000, a cardiovascular exam room at the hospital will be named after QTHON. QTHON is part of Dance Marathon, a nationwide movement by the Children’s Miracle Network Hospitals involving college and high school students. Since starting in 1991, Dance Marathon has raised more than $135 million for more than 170 affiliated hospitals. Last year’s QTHON raised more than $55,000.